Tablewar gives you some new army transport options with their MKII solid-faced cases. Surprise attack...keep your opponent in the dark right up to deployment. With the New TABLEWAR(TM) MARK II Solid-faced Display Tower you can conceal your army until you are ready for for your opponent to see them and, with the patented storage and display system from TABLEWAR(TM), you can then deploy your units in seconds. TABLEWAR(TM) Carries a full range of products for the Display, Storage, and Light Transport of hobby miniatures. 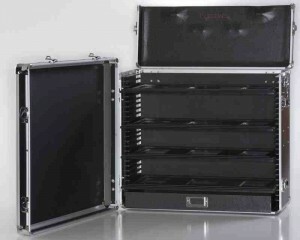 The patented Display Tower Cases are the centerpiece of this modular design. The new MKII Full-size case easily accomodates a full-size 40K* or Fantasy tournament army while the MKI Half-size case is still spacious enough to hold armies for Warmachine, Flames of War, and many other gaming systems. Once more, the MKI Half-size case makes for an excellent hobby "tackle box" with a drawer and space for your paints, brushes, and models in progress. The new MKII case features a plywood core and a new scratch-resistant exterior making it both stronger and lighter. All of the cases provide protection for hobby miniatures utilizing an Isolation system. With use of the TABLEWAR(TM) Unit Trays, Display Boards, & Unit Washers, individual miniatures can be secured magnetically in place without touching other miniatures or case components. This results in a storage and transport solution that will not add additional wear and tear to your models paint or wargear. The cases also are great for displaying the hard work you have invested in your miniatures; you can open up the case to reveal your entire army or keep the case closed and view your miniatures through the clear acrylic (and removable) front door. Not only are your miniatures protected and displayable, they are ready for use immediately. Units can be organized together on individual trays and pulled out together for immediate deployment. Once more, the fact that the entire system is modular, allows you to simply change your tray configuration as you add or remove units to your army.. or, even, insert an entirely different army or gaming system into the same case. The flexibility is endless.